Language Lizard will give away a free “surprise set” of bilingual books to at least one lucky winner every month for a year… so you have more chances to win! We are launching our most exciting BILINGUAL BOOK GIVEAWAY on October 1st, 2017, the start of Celebrating the Bilingual Child Month. October is an exciting month for language learners because it’s also Celebrating the Bilingual Child Month! Let’s take this opportunity to recognize the many children who speak two or more languages and understand multiple cultures. We can encourage literacy and parental involvement, and celebrate the children who work so hard to learn a new language. We will give away a free “surprise set” of bilingual books to at least one lucky winner every month for a year, so you have many chances to win. Over $1,000 of language materials will be given away! The multicultural children’s books offered in this giveaway will engage and inspire teachers and students in their continued language learning. How do I enter for a chance to win? The sooner you sign up, the more chances you have to win – enter today! For more information and details on the giveaway, visit our Giveaway Page. What languages will I receive? Winners will receive bilingual books in one or more of the languages listed on their entry form. Language Lizard bilingual books are available in English with Albanian, Arabic, Bengali, Bulgarian, Burmese, Chinese Simplified, Chinese Traditional, Croatian, Czech, Dari, Dutch, Farsi, French, German, Greek, Gujarati, Haitian Creole, Hebrew, Hindi, Hmong, Hungarian, Irish, Italian, Japanese, Karen (Sgaw), Korean, Kurdish, Latvian, Lithuanian, Malay, Malayalam, Nepali, Norwegian, Panjabi (Punjabi), Pashto/Pashtu, Polish, Portuguese, Romanian, Russian, Scottish-Gaelic, Shona, Slovakian, Somali, Spanish, Swahili, Swedish, Tagalog, Tamil, Thai, Tigrinya, Turkish, Twi, Urdu, Vietnamese, Welsh, Yiddish and Yoruba. *Note: Existing newsletter subscribers do not need to resubscribe. Books will be sent to US or Canada addresses only. Comment below and tell us how you celebrate the outstanding bilingual children in your life! World Teachers Day is coming up on October 5. Don’t forget to tell the wonderful teachers in your life how much their hard work is appreciated! World Teachers Day was first founded in 1994 by the United Nations to commemorate various intergovernmental recommendations regarding the rights and responsibilities of teachers around the world. These recommendations are guidelines that elevate the status of teaching and promote high quality education. We’ve teamed up for a K-2 Teacher Giveaway in honor of World Teachers Day. Enter now through October 7, 2017, for a chance to win! How will you celebrate World Teachers Day? Comment below and share! Children’s Day: Win a Multicultural Stories Book Set! Every June, Children’s Day is celebrated in more than 50 countries around the world. Generally, it’s a day to celebrate the happiness and growth of our children, and commit to protecting their well-being. Language Lizard is celebrating this day by promoting children’s literacy with a giveaway of Multicultural Books! In the US, Children’s Day is the second Sunday of June. While the holiday is not widely celebrated here, there is a movement to bring more attention to the holiday, and increase its popularity. Although the customs vary in each country, Children’s Day is usually celebrated with fruit juices, kid-pleasing treats, and fun decorations, like dolls and streamers. We’ve teamed up on a K-2 Teacher Giveaway of a Children of the World class library! Enter below by June 17, 2017, for a chance to win! Multicultural Books for National Reading Month & Giveaway! National Reading Month is a great time to try out a new multicultural book with your little ones! Celebrate with fun, diverse children’s books that introduce them to different cultures. And don’t miss out on the Multicultural Stories Giveaway we are co-sponsoring with our friends at I Teach K-2! What is National Reading Month? Every March, National Reading Month kicks off with NEA’s Read Across America, which celebrates the birthday of the beloved Dr. Seuss. All month long, organizations across the country hold events that celebrate the love of reading, and encourage kids and adults to enjoy new books or re-visit old favorites. Each day, something new makes Mimi think of her grandma, whom she misses very much. She misses Grandma’s special Saturday Soup, and her stories of life in Jamaica. Derek Brazell’s colorful illustrations brings this story to life, and make us wish we all had a remarkable grandma like this! How are new babies celebrated around the world? Tariq’s classroom gets to meet his new baby brother. During circle time, the students share the different ways their families welcome new babies into the world. Na’ima bint Robert brings us a beautiful, thoughtful exploration of cultural and religious diversity through the eyes of our children. This book by Thando Maclaren takes us around the world, to learn about different foods and traditions. Read about exotic dishes like fajitas, sushi, dhal, roti and more! Explore the diversity in children’s lives and develop a worldwide perspective with this book, which is part of the “Our Lives, Our World” series. Other titles in the series include Brrmm! Let’s Go! and Goal! Let’s Play! Little Li woke up on a Monday morning, only to discover that his tooth is wibbly wobbly! His tooth went wibble wobble all day, until PLOP! it fell right out. Now what will Li do with the tooth? This humorous story by David Mills, author of Lima’s Red Hot Chilli and Mei Ling’s Hiccups, explores different cultural traditions associated with losing a tooth. It’s a great story to start a class discussion about customs and shared experiences. Language Lizard is co-sponsoring a Multicultural Stories Class Library Giveaway… Enter below by April 1, 2017 for a chance to win! October is full of bilingual reading fun! In honor of two exciting events – Celebrating the Bilingual Child Month AND Language Lizard’s 10th Anniversary – we are proud to announce our biggest giveaway ever! 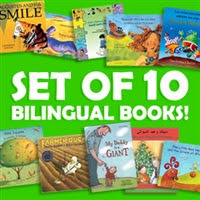 Enter to Win $300 in Bilingual Books from Language Lizard! Language Lizard will send one lucky winner a $300 Language Lizard gift certificate that can be used to purchase any of the bilingual / multilingual products available on the Language Lizard website. Books are available in English with Albanian, Arabic, Bengali, Bulgarian, Burmese, Chinese, Dari, Croatian, Czech, Dutch, English-only, Farsi, French, German, Greek, Gujarati, Haitian-Creole, Hebrew, Hindi, Hmong, Hungarian, Irish, Italian, Japanese, Karen (Sgaw), Korean, Kurdish, Latvian, Lithuanian, Malay, Malayalam, Nepali, Norwegian, Panjabi, Pashto, Patois, Polish, Portuguese, Romanian, Russian, Scottish Gaelic, Shona, Slovakian, Somali, Spanish, Swahili, Swedish, Tagalog, Tamil, Thai, Tigrinya, Turkish, Twi, Urdu, Vietnamese, Welsh, and Yoruba. Subscribe to Language Lizard’s Culture Connection newsletter (existing subscribers do not need to resubscribe). Comment on any of the posts on the Language Lizard blog during the month of October 2015. “Like” Language Lizard on Facebook or post about the giveaway on your own Facebook page. Tweet about the Language Lizard giveaway on Twitter. The maximum number of entry points one can receive is 5 (one for the form submission and one each for the actions above). Enter the giveaway, and find the full terms and conditions, here. Browse all the language learning materials the winner can choose from by visiting www.LanguageLizard.com. Celebrating the Bilingual Child Month was established in 2006 to recognize the many children that speak two or more languages and understand multiple cultures. This is a time to recognize their achievements, encourage continued language learning, and explore the differences and similarities of diverse languages and cultures with all students. These efforts will help connect our communities and improve global relations. For more information about Celebrating the Bilingual Child Month and tips on how you can celebrate this special month in your classroom, check out our blog post. If you’re getting ready to head back to school, we have two great giveaways for you! 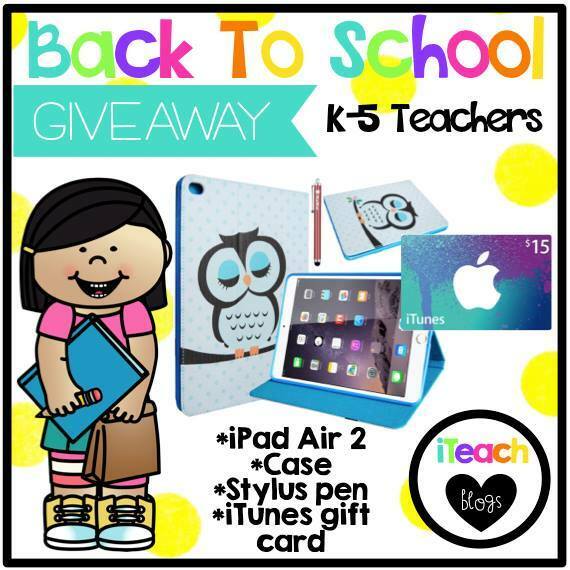 First, you should check out iTeachBilinguals and their Back-to-School Giveaway. You can enter now through August 8, 2015 by following this link. The grand prize winner will receive an iPad Air 2! A winner will be announced August 9, 2015. Another great giveaway for language learners is Language Lizard’s Cookbook & Bilingual Book Giveaway. You can win a copy of Room to Read’s Recipes Worth Reading cookbook AND a surprise bilingual book in English and the language of your choice! It’s easy to enter, no purchase necessary. A winner will be chosen September 16, 2015. Happy reading, and we hope you enjoy the rest of your summer! Summer is a great time to enjoy fresh food, try new recipes, and connect with family by sharing both a good meal and a good book. Language Lizard is making that easier with our “COOK & READ” Giveaway where you can win a cookbook and a bilingual book. Room to Read is an organization that “envision[s] a world in which all children can pursue a quality education, reach their full potential and contribute to their community and the world.” Our friends at the Central NJ Chapter of Room to Read have created a delightful cookbook, Recipes Worth Reading, with 150 recipes from around the world. Each chapter represents a country Room to Read operates in. There are sections with Appetizers, Soups & Salads, Eating Light, Allergen Free, One Pot Dishes, Desserts and more! Best of all, 100% of proceeds from the cookbook benefit Room to Read programs supporting literacy and gender equality in education in Africa and Asia. You can order the cookbook through the Barnes & Noble website. To learn more about Room to Read, visit www.roomtoread.org. 1) No purchase necessary: Simply fill out our contact form and write “COOK & READ” in the comments section, along with your choice of language from one of Language Lizard’s 40+ languages. 2) If you are making a purchase, you can write “COOK & READ” and your language choice in the order notes section, and you will also be entered. Bonus entry point: Tell us you posted about this giveaway on Facebook, Twitter or your Blog, and you will get one extra entry point! Language Lizard will accept entries until September 15, 2015, and three winners will be selected using Random.org’s number generator. One entry per person please. Giveaway & New Site to Celebrate Our 10th Anniversary! We are very pleased to announce the launch of our newly designed website! Just in time for our 10th anniversary, the new site is designed with a fresh new look, user-friendly navigation, and a variety of features to help educators, parents and librarians support their language learners. Finding the Right Bilingual Products Has Never Been Easier! Language Lizard still offers the high quality, beautifully illustrated, professionally translated books and posters you know and love. Our new website design features faster, easier navigation, whether you’re searching for a particular product, or want to make use of our many free resources. You can search by language, reading level, product type, or title. While you’re there, be sure to check out our new video, featured on the homepage, to learn about all the ways we can support you! To celebrate our 10th anniversary and our newly designed website, we are holding a special giveaway! Just send us your thoughts, opinions and suggestions for our new site via the Contact Us form, and you will be entered to win a Language Lizard gift certificate. The lucky grand prize winner will receive a $50 gift certificate, and 3 runners-up will each win a $25 gift certificate! All entries must be received by May 15, 2015. No purchase necessary.